My favorite bookstore in the whole world is a little place called Resistencia in Austin, Texas. They have a fantastic selection of rare and out of print books as well as a wide variety of titles by Native American, Latina/o, and black authors. They specialize in literature by people of color, poetry, Southwestern writers, and nonfiction on social justice issues, particularly incarceration. (Those of you who know me can see clearly why this is my kind of bookstore!) The books are just the beginning. A very active and progressive community organization called Red Salmon Arts also resides in this bookstore (which is in truth more of a community center than anything else) and hosts a ton of really exciting readings and social justice events. If I lived anywhere near Austin, I would be there all the time. 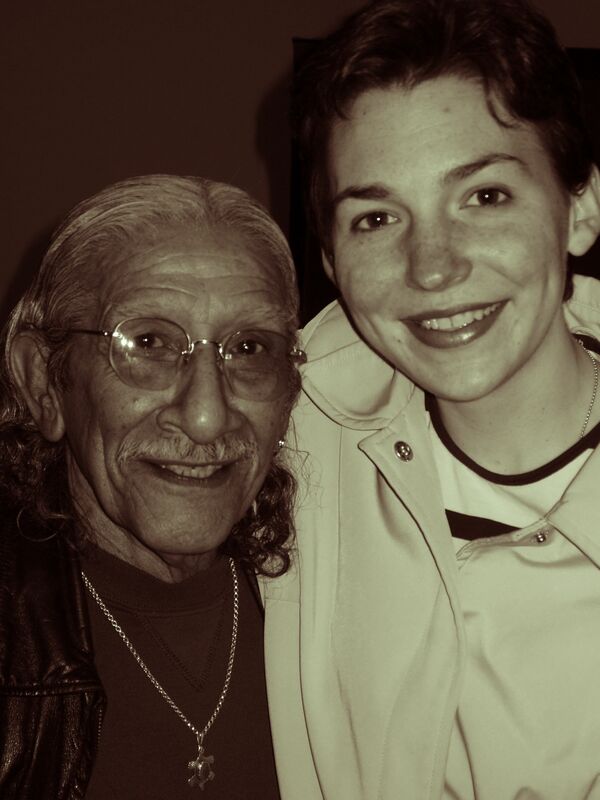 Resistencia’s founder, raulrsalinas (also sometimes written as Raul R. Salinas) was one of the greatest human beings I have ever known, and his life and legacy are honored every day by the work of the good folks who keep Resistencia and its programming going every day. I first encountered raul’s poetry when I was in high school–about a year and a half after my father entered prison. raul spent many years in prisons all across the US and wrote some of the most enduring poetry of the Chicano Movement from solitary confinement, including his landmark poem “Un Trip Through the Mind Jail.” His poems were the first pieces of writing that helped me begin to understand what my father experiences every day behind the walls. raul’s strength, fortitude, and passion for life gave me hope that my father and our family might be able to endure this particular form of devastation. After he got out of prison, he went home to Austin and spent the rest of his life doing work that served others–those in prison, struggling youth, and the people of his beloved Austin. My senior honors thesis when I was an undergraduate at Yale dealt with the subject of poetry written by Latina/o prison–a project inspired by raul’s writings. By the time I actually met raul in person, I was a graduate student at UC San Diego, living in Sherman Heights–a historic Chicana/o neighborhood in the heart of the city. The next neighborhood over from mine hosted a Barrio Book Fair in 2004, and raul was one of many distinguished speakers. I introduced myself to him and told him how much his work had shaped my understanding of incarceration and its impact on communities. By the end of the day, he had invited me to perform my then very new play about the families of prisoners, Doin’ Time: Through the Visiting Glass, at Resistencia. He was one of the earliest and strongest supporters of the play, and in hosting my performance, he not only provided opportunities for my work to grow but also introduced me to the incredible community of folks who make up Resistencia and Red Salmon Arts. GET THEIR EMAIL NEWSLETTER! I often learn of new book titles from the newsletter, which is awesome. It also provides listings of all the exciting events happening in connection with Red Salmon and Resistencia. Like I said, if I lived within driving distance of Austin, I’d be there every week. Send an email to revolu@swbell.net to sign up for the newsletter. DONATE TO SUPPORT THEIR WORK. You can mail a check made out to Resistencia Bookstore to the above address or use their PayPal account. Pa’ la gente de Resistencia, with gratitude and admiration. Believe it or not, I found out about this awesome project because a prisoner emailed me about it. * Martin Vargas, an incarcerated painter who has worked with the Prison Creative Arts Project (PCAP), sent me a message letting me know that our mutual friend and PCAP alumnus Julia Taylor was involved with this new venture called Prison Production which uses theatre to inform high school students in New York about how the prison industrial complex affects all of our lives. Prison Production is at the tail end of a fundraising campaign and have almost met their goals. If you’d like to donate to this incredibly worthy cause and perhaps receive a postcard or piece of artwork from Martin Vargas in the process (depending on the size of your donation), go to the Prison Production Website. *As a side note, here’s what it means for someone to be able to send email from prison. Generally speaking prisoners are only allowed fifteen minutes or so of computer use at a time, and depending on the state, they have a restricted list of people to whom they can send emails. Prisoners do not have email access as you and I know it. The computers on which they send and receive email are set up only to allow them access to their own email accounts and nothing else on the web. In some states, like Texas, prisoners can receive but not send email messages. This means that a prisoner in these states would never see or touch a computer but would receive a printed version of an email message sent by a person on the outside. The benefit of sending an email rather than a letter is that it reaches a prisoner faster than regular mail, usually within 48 hours and sometimes on the same day you have sent it. Sending an email costs the same amount as the going rate for a US Postal Service stamp, but the money goes to the corporation running the email operation. In both Texas and Michigan, prisoner email is run by a corporation called JPay. I prefer that my money goes to support the US Postal Service rather than JPay, but I will use it in a pinch to relay information that I want to reach someone quickly.